14 July 2015, at 6:00a.m. By 2050, it is estimated that 25 per cent of the global human population will live in Africa compared with just 0.6 per cent in Oceania. Industry analyst, Terry Evans, explains the impacts of these shifts on average egg consumption in these regions. By 2050, one in four of the world’s population will be living in Africa (Table 1 and Figure 1) The data for Oceania have been excluded from the graph because this region accounts for only 0.6 per cent of the world total. Between 2000 and 2015, Africa’s population expanded by 2.5 per cent per year from 808 million to 1,166 million. During this period, the world total increased at 1.2 per cent per year from 7,128 million to 7,325 million. Population growth is slowing everywhere, although between now and 2050, the forecast increase for Africa is 2.1 per cent per year against only 0.8 per cent for the global figure. 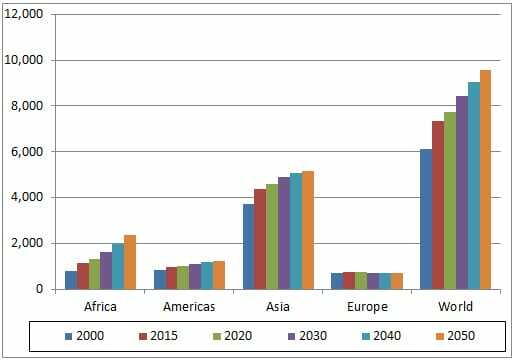 By 2025, there will be nearly 2,400 million inhabitants in Africa, of which 440 million will be in Nigeria, 187 million in Ethiopia, 155 million in the Democratic Republic of the Congo, 129 million in the United Republic of Tanzania, 122 million in Egypt, and 104 million in Uganda. The estimates by the FAO of egg supplies available for consumption (Table 2 and Figure 2) relate simply to the quantities of food reaching the consumer. Wastage on the farm and during distribution and processing is taken into consideration. However, the quantities of eggs actually consumed is likely to be lower depending on the degree of losses in storage, in the preparation and cooking, plate waste, the quantities fed to domestic animals or simply thrown away. Measurement of actual egg consumption takes place in only a few countries, the figures presented by the FAO being estimates of the available supplies divided by estimates of the human population. There is considerable scope for error in the calculations around the estimates of layer numbers (especially where village or backyard flocks make a significant contribution to production), average yields, the average weight of an egg (where consumption is expressed in kilogrammes per person), and also in the estimates of human populations. Indeed, the variation between the theoretical and actual quantities of eggs available for consumption could range from between five and 20 per cent around the figures, depending on the reliability of the data used in the calculations. With such considerable scope for error, the data for individual countries are best used as a guide to the trend and too much attention should not be paid to the actual figures and particularly to small differences from year to year. Also, care needs to be taken when comparing the data between countries. The figures provided by the Food and Agriculture Organisation (FAO) in Table 2 and Figure 2 reveal that, when compared with 2000, the estimated egg supplies per person has increased significantly in all regions of the world. Between 2000 and 2011, egg availability in Africa increased by almost 0.4kg per year. Putting this into a broader perspective, it has to be appreciated that this increase in the quantity available per person took place at a time when the human population rose from 808 million to 1,057 million, the combined effect being that total egg utilisation increased by an extra one million tonnes in 2011 compared with 2000. There are considerable differences in the quantities of eggs available for consumption between the African countries (Table 3). Looking at 2011, it appears that people in Liberia eat the most eggs at 9.3kg per person per year. The less good news is that availability in this country has declined the average slipping from above 10kg per person between 2000 and 2008 to below this figure since then. While consumption in Tunisia at 7.4kg per person is high for the region, over the period it has been relatively stable. In contrast, in South Africa, where average uptake in 2011 at 7.3kg was similar to that in Tunisia, the trend here has been positively upwards from the 5.4kg recorded in 2000. Data provided by the International Egg Commission (IEC) indicate that average consumption per person reached 137 eggs in 2011, rising to 153 in 2012 but then fell back to 147 in 2013. According to the South African Poultry Association (SAPA), lower levels of unemployment would give demand a boost, particularly as the cost-effectiveness of eggs as a protein source, if effectively communicated, provides an opportunity that the other animal industries do not have to the same extent. 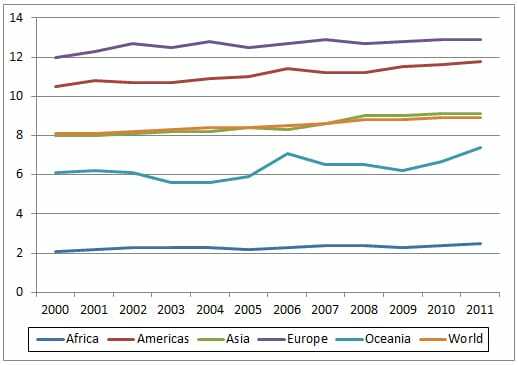 While it is good to see that the overall trend for Africa is one of increasing consumption per person, the less good news is that for a large number of countries, average uptake has declined since 2000. In some instances, this will be because available supplies have failed to keep pace with population growth. Throughout the region, it is generally accepted that eggs provide the highest quality and cheapest form of animal protein, hence the key to an increase in demand will be closely linked to rises in the spending power of the middle and lower income groups. For those countries in Oceania for which the FAO calculates available egg supplies on a per-person basis (Table 3), the annual average is significantly higher than in Africa. For the region as a whole, the quantity has risen from the 2000 level of 6.1kg per person to a new “high” of 7.4kg in 2011. The leading countries here in population terms are Australia and New Zealand, these two accounting for some 28.5 million people this year or 72 per cent of the regional total of 39.4 million. Although egg consumption in New Zealand in 2011 at 9.9kg per person was above the Australian average of 7.2kg, the New Zealand figure has declined since 2008 (11kg) which contrasts with the rising trend in Australia throughout the review period. Since its inception in 2003, the Australian Egg Corporation Ltd (AECL) has been focused on increasing egg consumption per person by generating awareness, increasing demand and promoting sales. Investment by the AECL has been directly attributable to changing consumer attitudes towards eggs and egg consumption. AECL’s Managing Director, James Kellaway, claims that, despite factors which can impact on consumption that are beyond AECL’s control such as the level of egg supplies, per-person consumption has been increasing at an average of 2.9 per cent per year over the past five years, reaching 210 eggs by February 2014, compared with 166 at the same time in 2003 – a gain of 27 per cent. Regarding consumers, perceived healthy levels of egg consumption have increased from 3.8 to five eggs per week. Those who think eggs have no affect on cholesterol levels have increased by seven per cent each year, while those who think that eggs have a large affect on cholesterol have declined by four per cent per year. Also, the AECL has successfully managed to change positively the attitudes of General Practitioners to egg consumption. Nevertheless, this organisation believes that, as well as promoting eggs, there is an increasing interest and need to start promoting the industry and egg producers.